Patrick Stewart has finally opened up about his upcoming Star Trek Picard Series, which is being developed for CBS All Access. We first learned of the project last August and it came as something of a surprise, since Stewart had retired the role following the movie Nemesis in 2002. But the actor was lured back, despite his trepidation in the early stages. The 78-year-old actor has been making the press rounds to promote his movie The Kid Who Would Be King. During a recent interview, he was asked about the untitled Picard series and, really for the first time, he's discussed in detail, to the degree that he can without getting in trouble. Patrick Stewart revealed that they've been in the writing room as of late and they're essentially working on a very long movie. Here's what he had to say about it.
" They are writing a 10-hour movie... We're hoping for more than one season... I've been in the writer's room for a total of three weeks over the last couple of months. The work that's being done there is extraordinary. Basically I just sit and listen... What we have coming up is exciting. It's exciting for me because it excites me as an actor. Oh, the story is great... It references the present day and times." For Trekkies, this would all seem to be great news. While not confirmed, it sounds like the hope is for a ten-episode first season, with more to come in the future if things go well. Alex Kurtzman, who is heading up the small screen Trek universe for CBS, is in charge of the series, which is set to debut later this year. 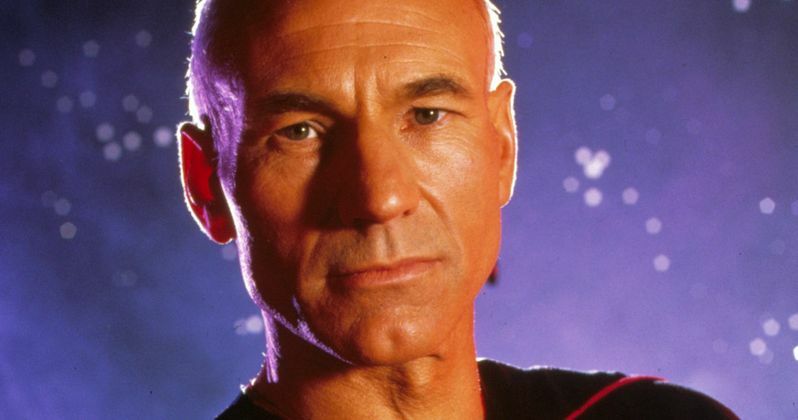 Speaking further, Patrick Stewart revealed that this wasn't an easy decision to make and, during his initial meeting, the intention was to kindly explain to them why he was going to turn the show down. Ultimately, they managed to win him over with their ideas. "It was a difficult decision because, although I loved being Picard and working on that series for seven years was a great experience with a wonderful cast and production team, there had been so many proposals. 'We'd like to have you in your uniform in this show.' Comedy shows, that kind of thing. I always said 'Nope. Nope. I'm done.' I agreed to a meeting with the people who were going to produce this new version of Star Trek only because I wanted to seriously and respectfully explain to them why I was turning the project down. In that first meeting, which maybe lasted an hour and a half or so, I heard just enough to realize this was something very unusual, and I was intrigued... What I was afraid of was, in some way, this was going to be jokey, and I didn't want to do that...' I asked a lot of questions and the answers were all very satisfying. I was struck by how clever these people were." Patrick Stewart also added that he'll look younger in this new series that he did in the Star Trek: The Next Generation finale. That episode, titled All Good Things, featured Picard with a beard and looking quite a bit older than what we had seen previously. While specific details are still being withheld, Jonathan Frakes recently confirmed that Picard won't be a Starfleet Captain in this series, indicating that he's since moved on to bigger and better things. We'll be sure to keep you posted as further details on the project are made available. This news was first reported by Yahoo.